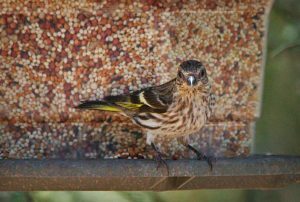 Not all finches have “finch” as part of their name, so you might be surprised just how many finches you have at your feeder. 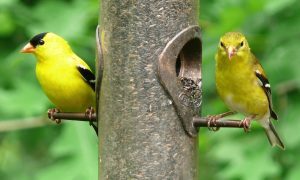 Common redpoll, northern cardinal, rose-breasted grosbeak, scarlet tanager, indigo bunting — all of these are actually finches. However, most of these are pretty easily identifiable. That is not necessarily true with all finches. 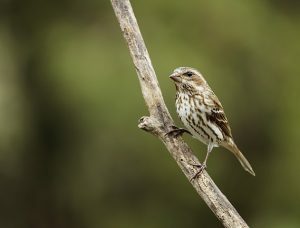 Some look quite similar in fact, such as the house finch, purple finch, pine siskin and even the American goldfinch, especially immature birds or winter males. The state bird of Iowa is common at sunflower and nyjer feeders, and the breeding birds are easily identifiable. Breeding males are bright yellow with a black forehead, tail and wings striped with white. Breeding females have similar coloring but are more of an olive green color, and the black head patch is very faint. 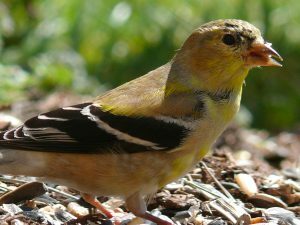 The wings are one of the keys that will help you identify goldfinches even when they are in non-breeding or immature colors, because the wings will have the two identifying white or pale wingbars. The other key to look for is the unstreaked body. Non-breeding males are a drab, unstreaked brown. Immature birds are brownish colored, still without any streaking. 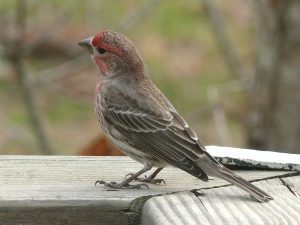 A house finch is another common visitor to bird feeders in northwest Iowa, and to feeders throughout the U.S. Males are easily identifiable because of their coloring, although their coloring can vary significantly. The male pigment comes from the food he eats when he is molting, resulting in varying redness and even orange or yellowish pigmentation. Male house finches have a rosy face and upper breast, without any red on the back or the wing, and with much less red on the face than a purple finch. Females are a streaky brownish gray without definitive lines on their face. The house finch also has short wings which makes its tail look long and has a shallower notch on the tail than most finches. It has the typical finch conical beak, but its header is rather long and flat. Many people confuse the house finch and purple finch, because they both have a reddish-purple color to their head and chest. The purple finch is a much more irregular visitor to northwest Iowa feeders, usually visiting black-oil sunflower seed feeders when it does stop by, and has some definitive differences to the house finch. 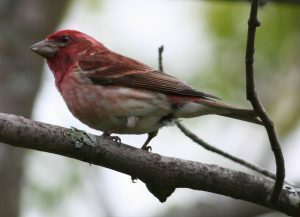 It has a darker head with more red than a house finch, and the red moves down the chest and mixes with white. The red color also goes into the wings and begins down the back, unlike a house finch. A purple finch may be chunkier than a house finch and has a short, notched tail. 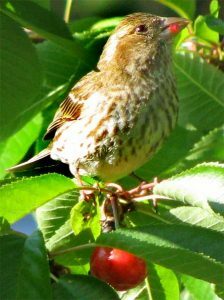 The female purple finch can be differentiated from the house finch because is is more coarsely streaked than a house finch. It typically has a whitish eye stripe and a dark line down the throat. 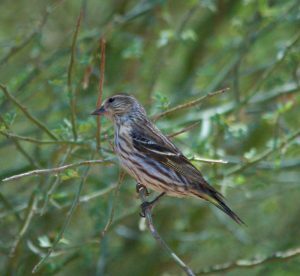 The pine siskin has less color than other finches. It is identified by its brown, streaked appearance with yellow edging on its wings and tail. It also has a sharp, pointed bill and the typical short-notched tail of a finch. Pine siskins like thistle and nyjer seed, and they also prefer evergreen forests.